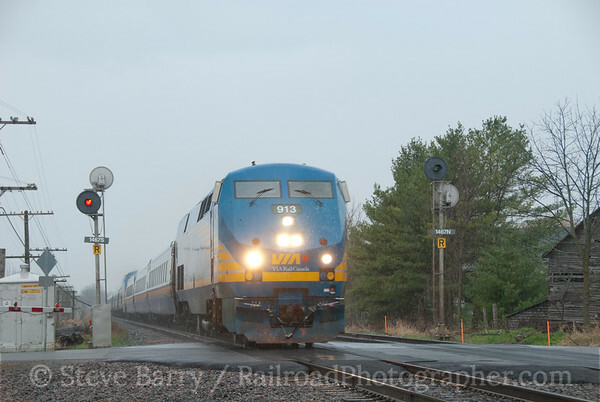 I was invited up to Ottawa to do a program for the Ottawa Valley Associated Railroaders, a large group of railfans and modelers, in April 2010. Coincidentally, my home Chapter of the National Railway Historical Society, the Wilmington Chapter, had been looking to do a set of streetcar charters in Toronto. 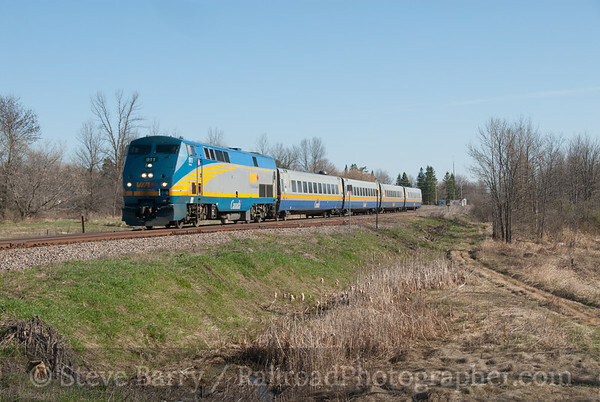 Combining the two into one trip into Canada seemed pretty logical, so on April 13 I set out with brother Bruce and friend Tom Moran for a trip north of the border. Photos for both April 13 and April 14 can be found here in Photo Lines. On the first day I met Bruce and Tom over at the airport in Scranton, Pennsylvania, where we ditched Bruce's car and headed north in my rental. Since the OVAR meeting was that night, we were on a bit of a time constraint, so we headed straight across the Canadian border at Thousand Islands. 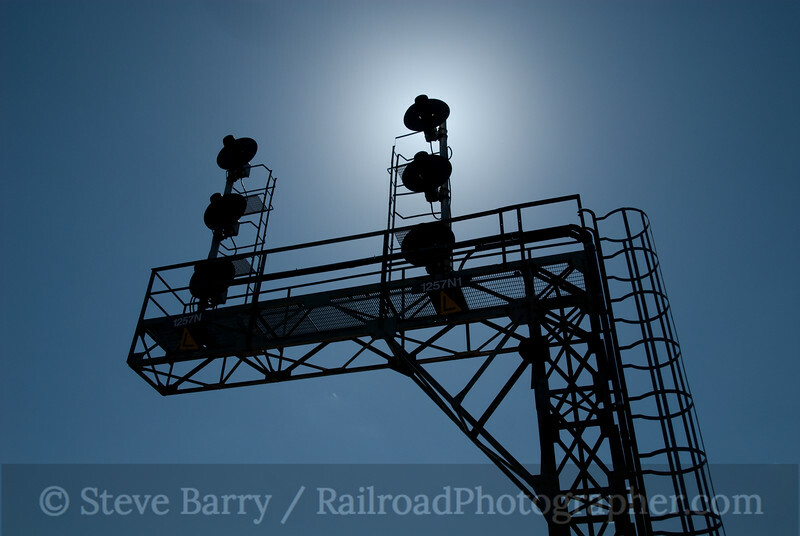 Once in Canada, we made a brief stop at Brockville, where we shot the signals and station. The light wasn't real good at the station for an eastbound (which is what we had coming), so we moved around the corner from the depot and got one VIA Rail Canada train from Toronto bound for Ottawa. From there, we pressed on to Ottawa. The OVAR meeting turned out to be a lot of fun. They are a large group (140 people at the meeting, which included a pre-meeting meal) and I really enjoyed giving the program. After the meeting it was off to a motel in Ottawa for the night. 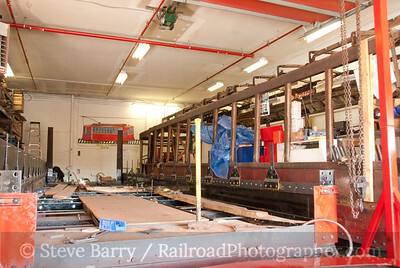 The next morning we were invited to take a look at the ongoing restoration of Ottawa streetcar 696 at the OC Transpo shop. We had time beforehand, however, to go looking for a VIA train or two, and a pair left Ottawa bound for Toronto and Montreal early in the morning. 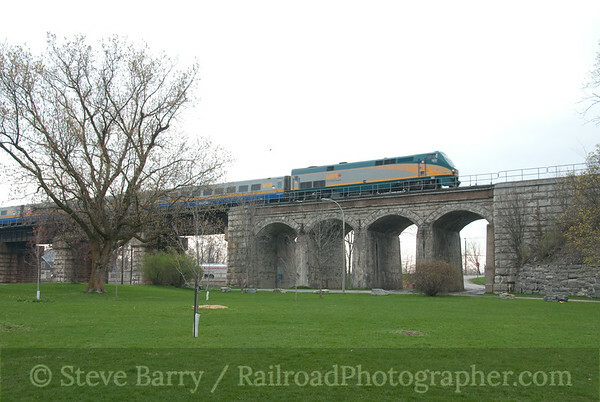 We set out looking for a spot to shoot the Toronto train first, finally settling on Richmond, Ontario. After shooting there, we scooted cross country to the Montreal line, but were too late getting there for the second VIA train. From there we went back into the city to the OC Transpo shops. 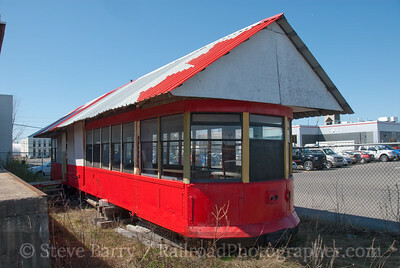 We took a look at car 696, which is undergoing a full restoration to operation (which can't happen until Ottawa gets a new electric light rail system put in). Also at the shop was car 905, which had been rescued from its second career as a summer cottage. 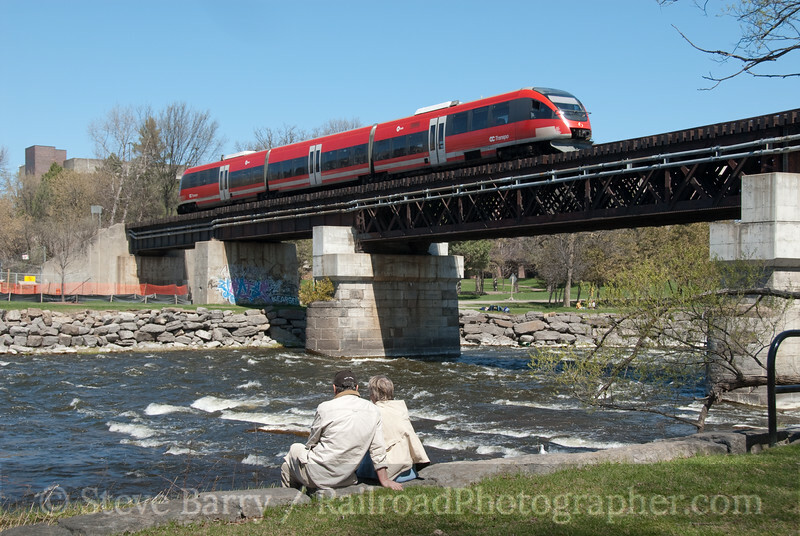 After our tour of the two cars, we headed over to where Ottawa's diesel-powered light rail line crosses the Rideau River near Carlton University. Dubbed the O-Train, the five-mile line features two trains in service simultaneously, and all northbound and southbound trains are scheduled to meet just north of the Rideau bridge at the Carlton station. 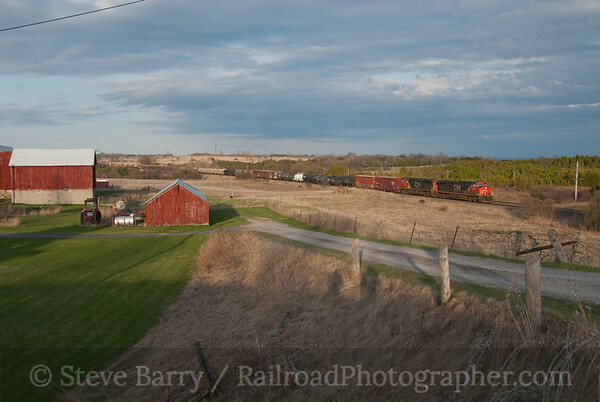 We shot many trains on the bridge, but then got out of town -- there was a shot southwest of the city calling my name. Our afternoon destination was Dalhousie, Quebec, where a surviving water tank still stood along the Canadian Pacific main line. I had spent an afternoon there in 2009 but didn't get any trains. All I wanted was one westbound in the afternoon, and I'd be happy. Along the way we made one brief stop to catch VIA at Maxville, Ontario, then we got to Dalhousie, which sits right on the Ontario-Quebec border. With the CPR quiet, however, we decided to gamble and leave the shot of the tank (even though it was perfectly lit) and grab a shot of VIA up at Glen Robertson, Ontario. Well, you can probably guess what happened. 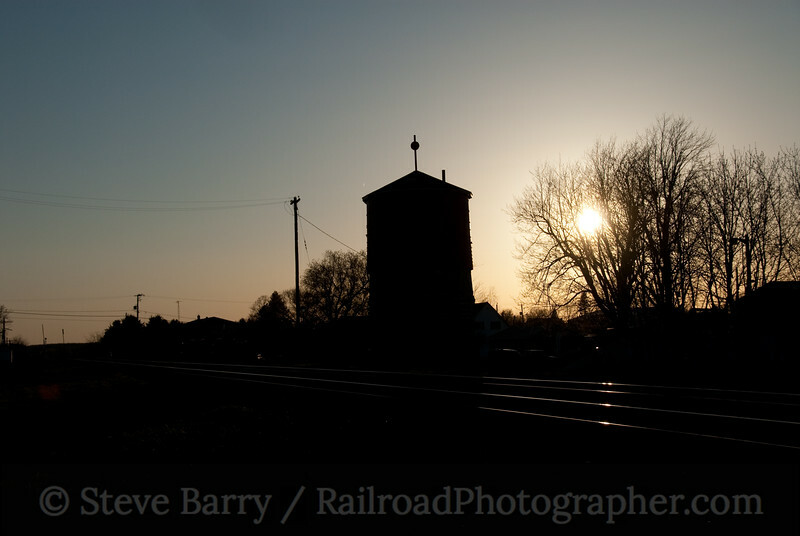 Yup, as we headed back to Dalhousie a westbound CPR train passed the water tank in perfect sun. We were about three minutes too late -- in fact, the rear of the train was still on the crossing in Dalhousie as we came to a sad, mad stop in town. Okay, that didn't work. After another long wait with nothing happening, two more VIA trains were due heading for Montreal. We decided to gamble (again) and headed just east of Dalhousie to the diamond at DeBeaujeu where the CPR main line crosses VIA's Montreal-Ottawa line. Here we were rewarded with a couple of trains -- and CPR didn't show up to make us mad this time. 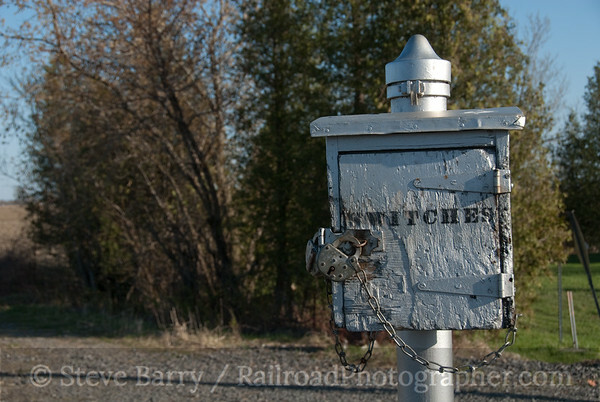 A couple of signal boxes with locks for both Canadian National and Canadian Pacific made for some nice "detail" shots as we waited for trains. Back at Dalhousie the wait for a westbound CPR freight resumed. The sun was rapidly setting, and all we got was two out-of-the-sun eastbounds. The sinking sun made for some very nice silouhette shots of the tank, but that still wasn't what I was after. Very reluctantly, we finally packed up at sunset and headed for a motel in Cornwall. Once again, I had been beaten by the tank. Photos for April 15 can be found here in Photo Lines. We awoke in Cornwall as the sun was rising into a clear sky. That silouhette shot we had gotten at the tank at Dalhousie at sunset the previous night kept going through my brain -- that wasn't a bad shot for a morning eastbound. The sun was out, we had some time -- "We're going back to Dalhousie," I declared. So back we went. 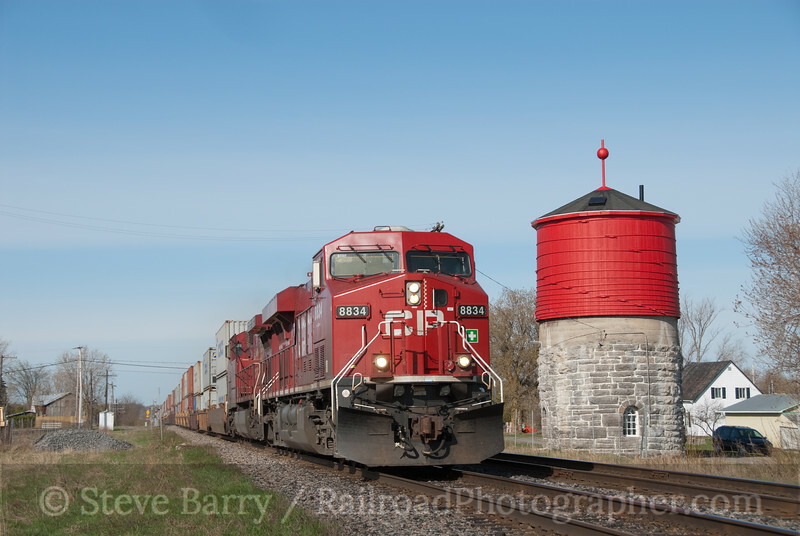 This time, luck was very much on our side, and it didn't take long to get an eastbound Canadian Pacific freight rumbling past the water tank. One of the primary missions of the trip had been accomplished! With that piece of business out of the way, we heard on the scanner what sounded like a train up on VIA's line at Glen Robertson. 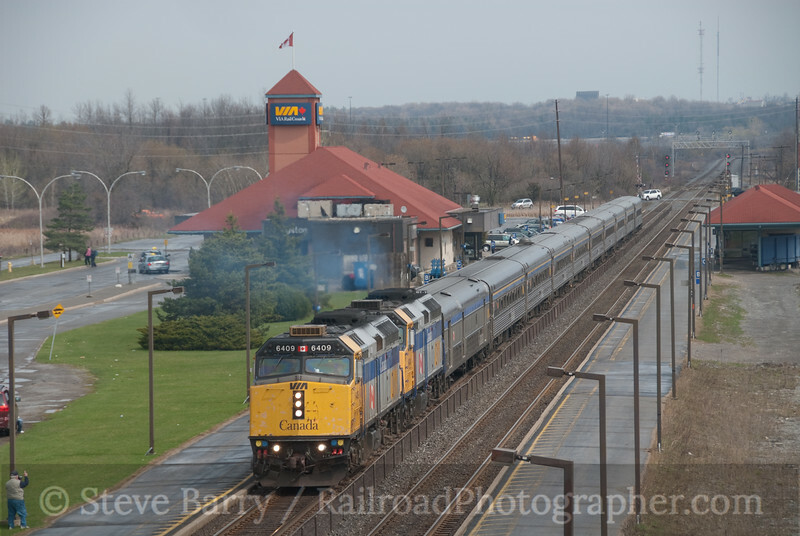 We headed up there to investigate, and sure enough there was a Canadian National local, led by a battered locomotive, taking the switch onto the old Ottawa Central (which CN had just recently bought back). The train quickly vanished into the trees to do some switching, so we headed up to Glen Sandfield to wait him out at the crossing. Eventually he arrived and we got our shot. 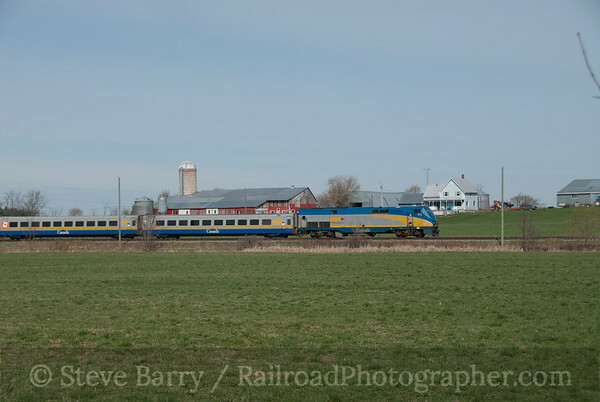 Next up was a Montreal-bound VIA train, so we returned to the main line at Glen Robertson and got a broadside shot passing a farm. With that train out of the picture, we were then left to try to figure out what to do next. Hmmmmm.... We finally settled on chasing that CN train up the Ottawa Central on its way to Hawkesbury. We headed up the line and finally overtook the train at Vankleek Hill, which has a small yard used when the OC ran the line. The train only paused for a moment here before resuming its journey up the line. We'd get him again crossing the fields at Green Lane. Alas, once in Hawkesbury we found that photo opportunities were limited. We broke off there and headed back down to the VIA main, which had two trains due through -- one Montreal-bound and one headed for Ottawa -- in fairly short order. We decided to head for the station in Alexandria to shoot them. Our arrival into Alexandria had a bit of a surprise -- the Montreal train was already sitting in the station! As it turns out, he was running about ten minutes early, so we had plenty of time to park (more or less), get out and get a few photos before he departed. The meet occurred "just around the corner" at DeBeaujeu, so we didn't have long to wait for the Ottawa train. We shot him in the station, and again as he made his departure. With the day pretty far along at this point, we had to make a decision -- we were ultimately heading for Toronto, but we weren't really in good range to see a lot before darkness settled in. 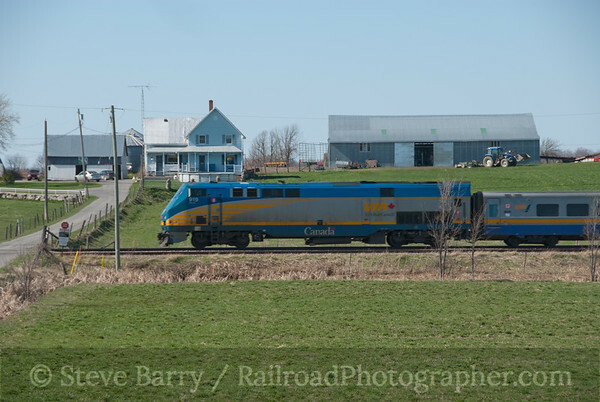 We decided to head back the wrong direction, eastward towards Montreal, and hit the Canadian National main line at Coteau, Quebec. This is where Ottawa-to-Montreal trains join the main line, plus there are the through Montreal-Toronto trains, a yard, some freight, a station and a three-track signal bridge. Plenty of stuff to shoot. Our arrival pretty much coincided with a westbound VIA train powered by one of the "genesis" diesels pulling LRC cars. About 45 minutes later we got a treat, as an F40 pulling an all-stainless steel train headed westward. 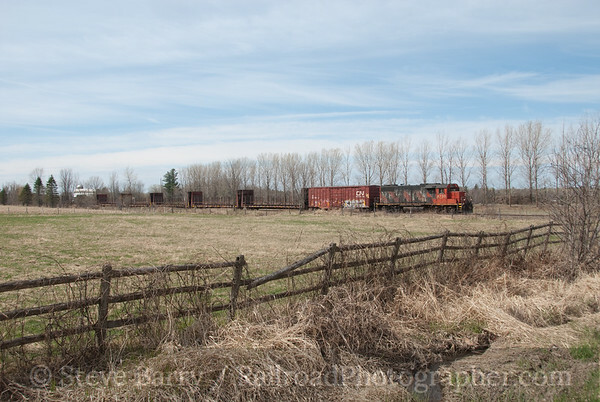 An eastbound CN grain train was through shortly thereafter. As soon as the eastbound freight cleared, we got a westbound VIA train under the signal bridge, followed by a freight 20 minutes later. A local freight pulled into the yard, and the day finished off with one more eastbound VIA train and two more westbound VIA's. A nice show to end the day. Photos for April 16 can be found here in Photo Lines. We were back in Cornwall for the night and when we awoke, unlike the previous morning, we found clouds and rain. The clouds had actually moved in the previous day while we were at Coteau, but now they had precipitation along with them. 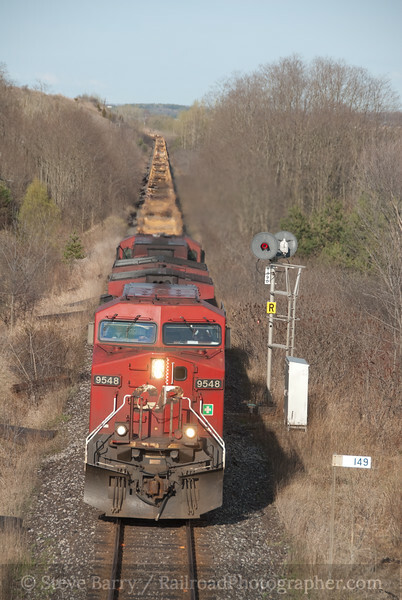 We headed west towards Montreal, and almost immediately picked up a westbound Canadian National freight. 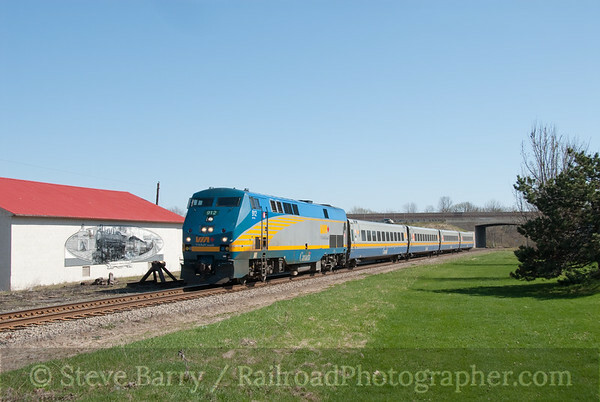 We gave chase, finally pulling off the freeway and down to the tracks at Ingleside, Ontario. Unfortunately, we were blocked by a gate here and couldn't get a really good shot, so we headed back out, this time getting the train at Maitland. We knew we had both east- and westbound VIA trains coming, so we headed into Lansdowne where the two trains met almost in front of us (actually just a few seconds apart just to our east). 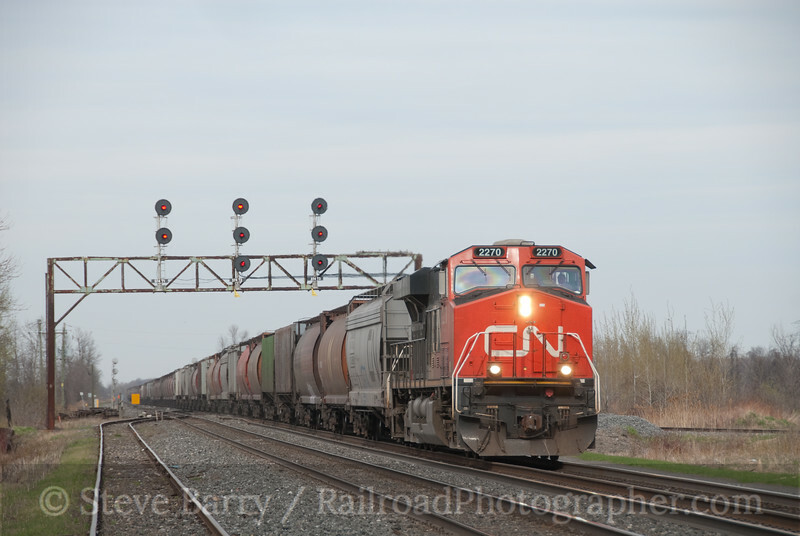 Just as we were leaving, we spotted a headlight and caught a Canadian National freight heading east through the signals in town. 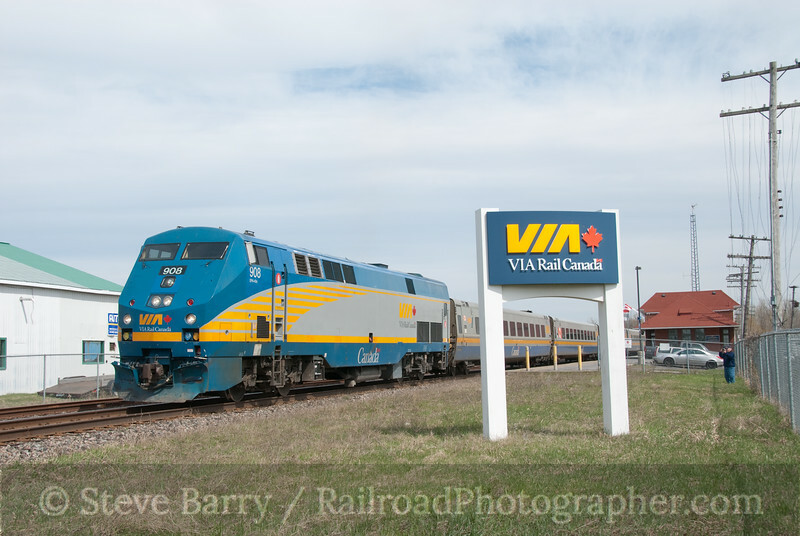 We continued our westward push, stopping at the VIA station in the middle of nowhere at Gananoque, Ontario. With the rain still coming down, we got a westbound and eastbound freight about 20 minutes apart. The (fairly) new construction station, built for VIA, now houses a model railroad club and a small VIA waiting room; only a few trains stop here. We arrived at the next big town, Kingston, with the rain still falling. 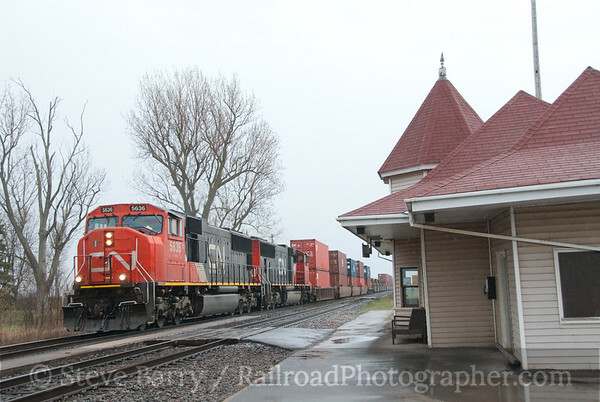 An eastbound VIA train was due, and as he made his station stop a westbound freight came by. 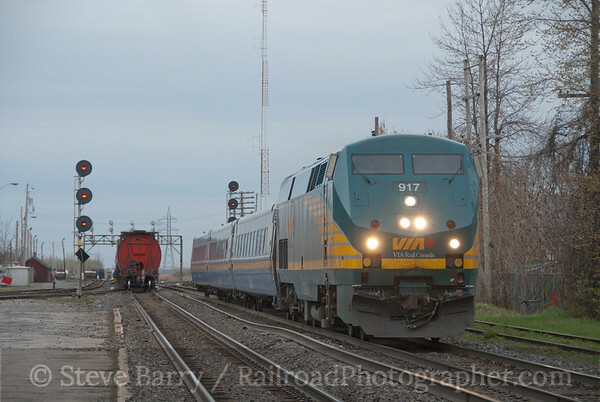 Fortunately, the freight cleared before the VIA train proceeded east, so we were able to photograph both trains. The VIA train would split at Brockville, with one section going to Montreal and the other to Ottawa; interestingly, the two trains operated as one unit, complete with the Ottawa section's locomotive tucked into the middle of the train! Up next was the train we were looking for -- a Windsor-bound train that would have F40s on the point and Budd-built stainless steel cars following -- almost a 1950s streamliner (ignoring the F40 for a moment). While this westbound train made its stop, something nice happened -- the sun came out! The clouds had returned by the time we made our next two stops. 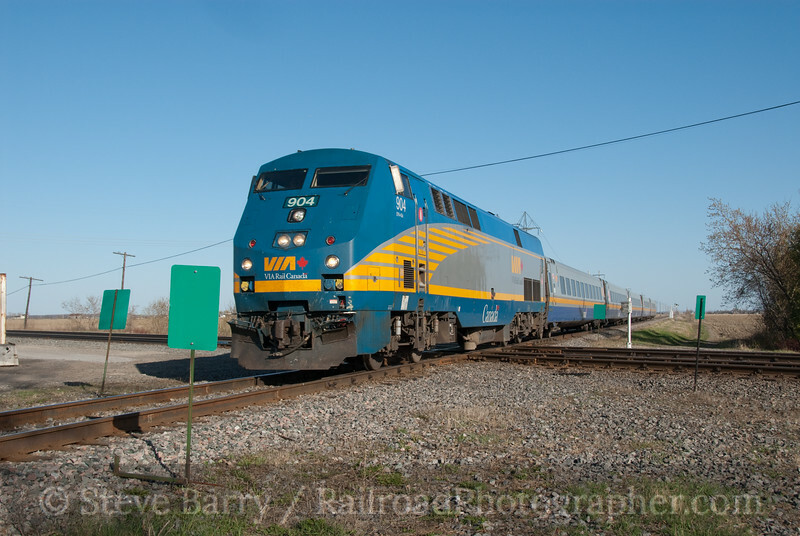 We caught eastbound and westboundVIA trains at Napanee on the bridge located there, then we shot a westbound VIA train at Belleville. 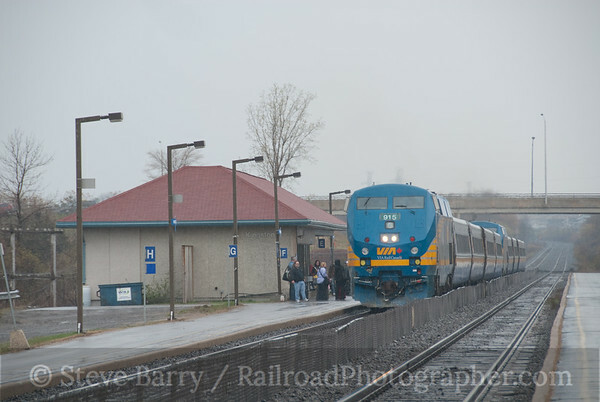 The next stop was at Trenton, where the Canadian Pacific and Canadian National run side-by-side. 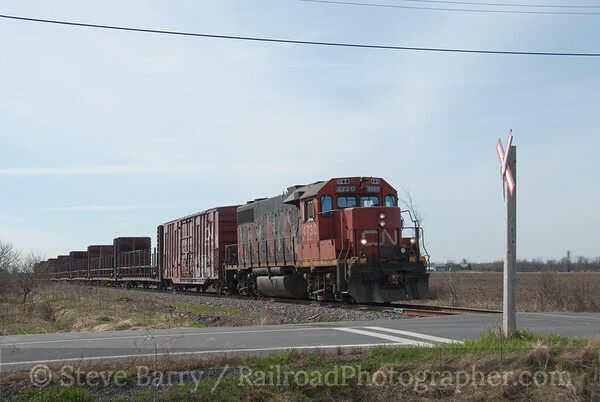 We caught an eastbound CP freight and a westbound VIA train on the CN, but the photo angles were pretty tight. Heading west, the CP and CN remain fairly close together, so we headed towards Newtonville, a location that has bridges over both railroads. We didn't get to Newtonville -- at least not right away. I spotted the end-to-end wooden bridges over the two railroads at Wesleyville, and with the sun out we decided to make our stand there. The Canadian Pacific was up first, with a prefectly-lit view of a train passing the signal on single track. Then the double-track CN got into the action with two westbounds -- a freight followed by VIA. 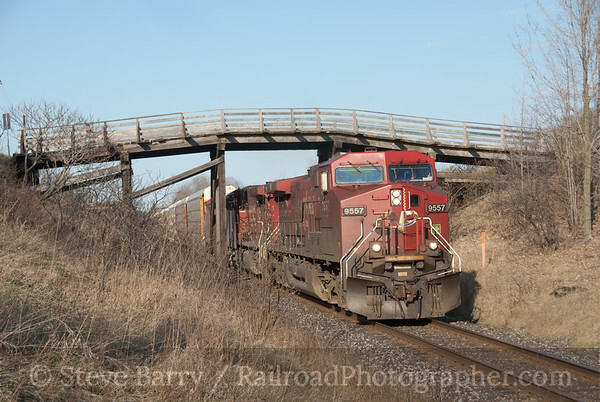 Back over on the CP, we got a westbound passing under the wooden road bridge. We finally moved down to Newtonville, where (with the sun still out) we got an eastbound VIA train and a westbound CN freight right at sunset. Time to head to Toronto! To be continued -- check back.